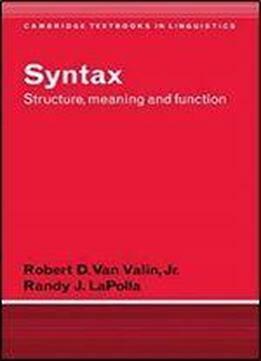 This book is an introduction to syntactic theory and analysis which can be used for both introductory and advanced courses in theoretical syntax. Offering an alternative to the standard generative view of the subject, it deals with the major issues in syntax with which all theories are concerned. It presents syntactic phenomena from a wide range of languages and introduces students to the major typological issues that syntactic theories must address. A generous number of exercises is included, which provide practice with the concepts introduced in the text and in addition expose the student to in-depth analysis of data from many languages. Each chapter contains suggestions for further reading which encompass work from many theoretical perspectives.